Learn different techniques to convert your Corner Kick set pieces into goals! Use these techniques to break up the opponent's formation and score lots of goals! Corner kicks are a good opportunity to score a goal. It doesn't necessarily have to start with a cross. There are different ways to set a play strategy to pull off goals from corner kicks! 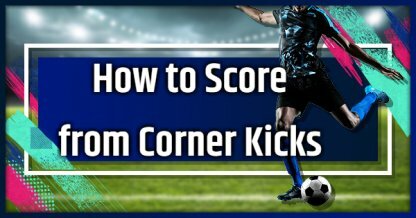 It would be better if your Kick Taker possesses the "Corner Specialist" trait as it complements the other stats mentioned in the list above. Your Gauge is located under your player name in your HUD. Pressing the lob button will let you power up the gauge. Longer presses fills the bar more. Get to know your Power Gauge to help you corner kick more accurately! If you fill up the gauge, the ball will travel fast towards the near side of the goal. Having a gauge filled with less power will make it slowly travel to the far side of the goal. Call for one of your teammates to go closer to the corner using the L2 / LT buttons. This will make the opposition guarding him follow. Now that there is space in the middle of the goal area, choose an action below. 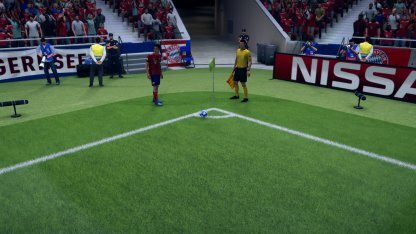 Call a second player using the L2 / LT buttons, then use a Short Pass to that team mate first. Next, build up your offence so the opponent's formation is broken down, and then choose an action from the table below! Crossing by Original Kicker Pass back to the Original Corner Kicker. Then, cross the ball to the far side! Crossing by Reciever Pass receiver uses the drag back move to get through the opponent. Run to open space, and cross to the far side! The Drag Back is an effective Skill Move that will let you quickly turn around, leaving behind your opponents. Use this to get to the open space faster!